When I made the CoffeeShop Distressed Flower Cards I decided to turn the flowers into Photoshop patterns. These patterns work in all newer versions of Photoshop and Photoshop Elements, just load them with Edit, Preset Manager. To fill something with a pattern, just select your paint bucket tool (or Edit, Fill, Pattern) and make sure Pattern is selected, select the pattern you wish to load, and then "pour" the pattern onto your background. These are seamless patterns so you can use them anywhere. They work great for texture backgrounds, cards, blogs, etc. You can easily change the colors by using hue/saturation and selecting Colorize. 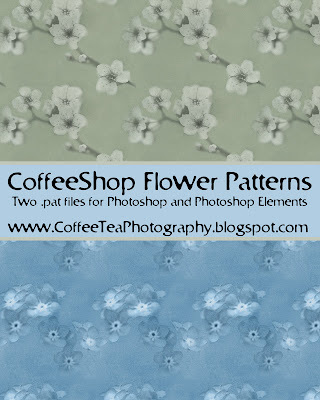 Download the CoffeeShop Flower Patterns HERE! Thank you so much for this Freebie. I want to let you know that I posted a link to your blog in Creative Busy Hands Scrapbook Freebies Search List, under the Photoshop/Gimp Resource(s) (Brush(es), Swatch/Palette, ...) post on Mar. 26, 2009. Thanks again. Love patterns! Thanks so much! Absolutely wonderful! Thank you so much.